The New Year is upon us! This year, we are introducing a new Integral Flow yoga class, inspired by the dynamic, flowing movements of vinyasa-style yoga, and combined with the meditative, gentle approach of Integral Yoga. One full hour of more vigorous postures, synchronized with the breath, followed by a half hour of complementary practices like deep relaxation, pranayama and meditation. 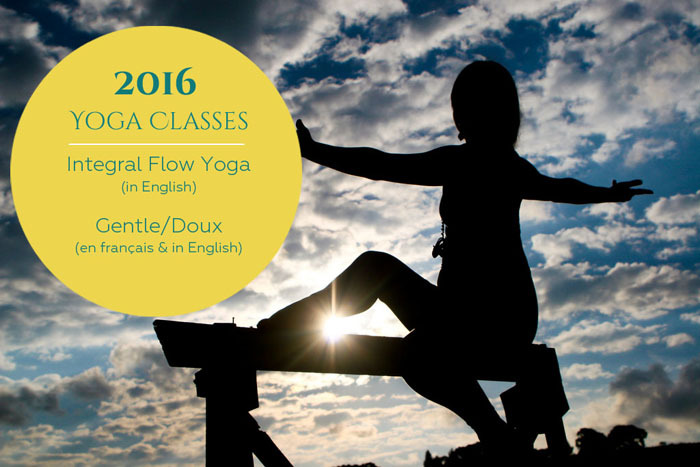 Recommended for intermediate students or those with a basic familiarity with yoga asanas. Thursday evenings at 6:15 PM. For more information, see Classes and Schedule. 1. New Integral Flow class, Thursdays at 6:15 PM. Runs until March 3. 2. Notre classe de yoga doux en français a déplacé au lundi à 18 heures. 3. Wednesday morning English gentle/restorative yoga class has moved to Thursday mornings at 10:30 AM. Monday morning classes remain the same. 4. New gentle/restorative yoga class in English on Fridays at 6:15 PM. Runs from January 15 to March 18, 2016.